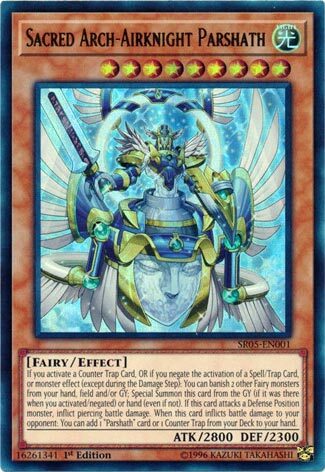 If you activate a Counter Trap Card, OR if you negate the activation of a Spell/Trap Card, or monster effect (except during the Damage Step): You can banish 2 other Fairy monsters from your hand, field and/or GY; Special Summon this card from the GY (if it was there when you activated/negated) or hand (even if not). If this card attacks a Defense Position monster, inflict piercing battle damage. When this card inflicts battle damage to your opponent: You can add 1 “Parshath” card or 1 Counter Trap from your Deck to your hand. Sacred Arch-Airknight Parshath is a mouthful of a name for a Level 9 Light Fairy-type monster with 2800 Atk and 2300 Def. Use Rebirth of Parshath to pull this straight from the deck. His own Special Summoning condition is not ideal. After something is negated you can Special Summon SA-AP (lol) by banishing two fairy’s from your hand, field, or grave. He can be summoned from the hand or grave this way, increasing his utility. Having multiple options for a Special Summon is good, but not as good due to being Level 9. His second effect is typical for Parshaths, that being piercing. Instead of drawing a card for inflicting battle damage, you can add a Parshath card or a Counter Trap to your hand. In his own deck, the specificity is good, but it does limit SA-AP to just Counter Fairy’s. This makes sense for the boss monster of the deck. Furthermore, it is likely that there will be more Counter Traps released and more Counter Fairy’s released. Sacred Arch-Airknight Parshath isn’t the best boss (Level 8 would have been killer) but he’ll do for now. Every Structure Deck ever has a boss monster and Wave of Light is no exception. Like most modern Structure Decks though, this one does have a good boss in Sacred Arch-Airknight Parshath. With this guy, we now know Parshath is an archetype now besides the original Airknight and the evolved form. Arch here is a Level 9 with 2800 ATK and 2300 DEF also being a Light Fairy. Light Fairy is standard in Counter Fairies. Level 9 is next to Level 11 as being one of the strangest Levels in the game, sadly it isn’t Level 8 for Trade-In, Counter Fairies could of used that extra consistency. Stats are good, though. If you activate a Counter Trap or negate a Spell/Trap or Monster Effect, you can summon this guy from the hand or GY by banishing 2 Fairies from the hand, field, or GY. The only time you can’t do this is the damage step, which is standard. The summoning conditions are the easiest to fulfill in Counter Fairies, which is what this was meant for. The Heralds can help trigger this by fueling the GY and negating an effect to trigger this guy’s summoning condition. Also Counter Traps take up a quarter to half of most Counter Fairy builds. Also the Rebirth of Parshath card from earlier this week can summon this when used. Arch here does piercing, which I will not complain about on a 2800 body. When Arch does damage, you can search for a Counter Trap or Parshath card. I won’t list all the good Counter Traps, there is just too many, and the only card the Parshath should matter with is Sanctum, because even if Rebirth of Parshath wasn’t a Parshath card, it is still a Counter Trap. Honestly this is a great boss monster for a deck, and standard decks play their boss monster at 1 or 2 unless the boss is that easy to summon and is super amazing for the deck. This card is great, but summoning it with his own effect can be hard, you rather rely on Rebirth. The fairy version of Ultimate Conductor Tyranno is upon us. Hey guy, take a bath, because you’re filthy. Counter Fairy decks have evolved over the years from initially attempting to harmonize the fairy types with counter traps to instead all-out stuffing the deck with as many busted counter traps as possible and then hopefully plussing off them via a handful of the best fairy types. Sacred Arch-Airknight Parshath joins the fray with Bountiful Artemis and Guiding Ariadne as a holy triumvirate of counter trap-abusing monsters that one could argue is really all you need. I’m not sure if fairy types were initially meant to be fully associated with counter traps, but they have certainly morphed into that over the years. In fact, it’s gotten to the point where it’s hard to imagine a fairy type monster (that actually looks like a fairy/angel) that doesn’t have an effect related to counter traps. Well, that just makes Sacred Arch that much better. Since angels are so closely associated with counter traps, he’s virtually assured of future support. Really, when you think about it, this monster only gets better when even one more good counter trap card is introduced. While it’s a shame he’s level 9, which is far worse than 8 or 10, that’s becoming less and less of a problem in this link era. But you know what’s not a problem? Getting a lot of plusses, and Sacred Arch provides that in spades. That fact that he has no restrictions on any of his effects is absurd. And while there’s nothing in the meta right now that screams for abuse of that fact, that doesn’t mean there won’t be something that can do so in the future. And oh, by the way, this monster doesn’t have to have any other Parshath support to work the way he wants to. This is a barn-burning angel that will be run in counter fairies for years.